a. Pristina is the capital and Prizren is the historic capital of Kosovo. b. 2014 estimate. A new estimate has been added in order to give a more correct GDP per capita. c. Preliminary results of 2011 census, which excluded four northern Serb-majority municipalities where it could not be carried out. 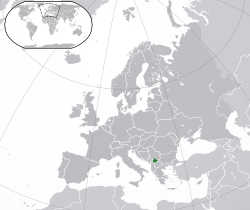 d. Adopted unilaterally; Kosovo is not a formal member of the eurozone. 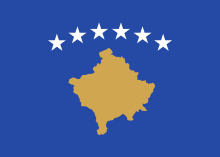 e. Assigned 15 December 2016 to Kosovo by ITU. +381 was previously used for fixed lines. Kosovo-licensed mobile-phone providers used +377 (Monaco) or +386 (Slovenia) instead. f. XK is a "user assigned" ISO 3166 code not designated by the standard, but used by the European Commission, Switzerland, the Deutsche Bundesbank and other organisations. ↑ "Assembly approves Kosovo anthem", b92.net, 11 June 2008. Link accessed 11 June 2008. ↑ "Water percentage in Kosovo (Facts about Kosovo; 2011 Agriculture Statistics)". Kosovo Agency of Statistics, KAS. Archived from the original on 29 August 2017. ↑ "Demographics of Kosovo (2016)". Geoba.se. Retrieved 2017-08-29. ↑ "Distribution of family income – Gini index". The World Factbook. CIA. Archived from the original on 4 June 2011. Retrieved 31 August 2014. ↑ "Kosovo Human Development Report 2014" (PDF). Swiss Cooperation Office Kosovo. 2014. Archived (PDF) from the original on 30 April 2015. Retrieved 4 July 2015. Boggan waxaa markii ugu dambeysay wax laga bedelay 10:23, 29 Luuliyo 2018.